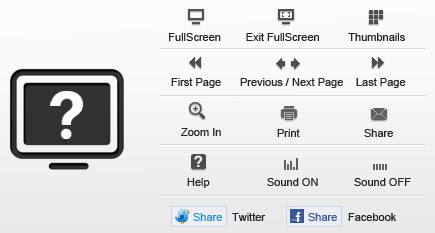 Handy Template offers simple interface style, useful and handy tools to control flipbooks. All functional tools can be show or hide flexibly in the Template. There are various tools can be used in this Handy Template, including Logo, Thumbnail, Help, Full Screen, Sosical Share, etc.. There are different feature tools can be used in the Handy Template, and the intuitive "Help" window explains all icon features as the left image shows. All functional tools can be show or hide flexibly in this Handy Template, including the Top toolbar, Logo, Thumbnail, Share, Sound, etc.. The Flexible Template also provides beautiful and useful thumbnail bar for readers to preview pages and go to interested pages quickly. The animated thumbnail bar will help to make your flip book more amazing and different. If you use the Handy Template to decorate your flipping ebooks, the two social network sharing icons will be shown on the toolbar. After publishing the book online, readers can onekey share your published flipbook via Facebook and Twitter quickly. Easy distribute your flip books with using Handy Template.